PlayStation 4 Pro and Xbox One Scorpio are both on the way, but not all mid-generation upgrades are created equal. Sony and Microsoft are taking distinctly different approaches to their higher-end console updates. We know a lot more about PS4 Pro since Sony gave the console its official debut in September, but Microsoft's said enough about Xbox One Scorpio (not the final name) that we can already make some telling comparisons. Keep checking back as we learn more about the two systems. Do PS4 Pro and Xbox One Scorpio do 4K? That's a qualified "yes"! Both PS4 Pro and Xbox One Scorpio are capable of displaying games and movies at 4K resolutions. But while PS4 Pro games will mostly be rendered at less-than-4K resolutions then sized-up to fit 4K TVs, Microsoft says its first-party games will "natively render at 4K". This is roughly the difference between using a smaller image for your background and stretching it to fit, and using an image that already has the same number of pixels as your display. They'll both produce a picture of the same size, but the latter will be able to show smaller details with better definition. Note that even high-end gaming PCs currently struggle to run high-end games at 4K resolutions, so Microsoft may be using a somewhat broad definition of native 4K rendering here. Do PS4 Pro and Xbox One Scorpio support HDR? If you're not familiar, HDR (high dynamic range) is a set of rendering and display specifications that aim to make brights brighter, darks darker, and colors more varied and vivid on supported displays. Sony has spent a lot of time singing the praises of HDR visuals since it announced PS4 Pro - it is also a TV company, after all - and PS4 Pro will definitely use the technology. Microsoft hasn't gotten that specific about Xbox One Scorpio yet, but we do know that the current model of Xbox One S supports HDR displays. So its powered-up cousin almost certainly will as well. Can PS4 Pro and Xbox One Scorpio play UHD Blu-ray movies? PS4 Pro has a Blu-ray drive just like the standard PS4 before it. Unfortunately, that kind of Blu-ray drive can't support discs with enough storage for 4K movies by default. You'll have to stream all of your 4K entertainment on a PS4 Pro (watch those bandwidth caps). Xbox One S, however, does have a UHD Blu-ray drive, so Scorpio probably will too. Which is more powerful, PS4 Pro or Xbox One Scorpio? It looks like Xbox One Scorpio will be a more powerful system than PS4 Pro. Numbers-wise, PS4 Pro has 4.2 teraflops of graphics processing power, while Xbox One Scorpio gets even terafloppier with 6. More broadly speaking, Xbox One Scorpio will come a year after PS4 Pro, meaning it will have time for better components to become cheaper, smaller, and more suitable for consumer devices. That's Moore's law in action. Do PS4 Pro and Xbox One Scorpio play all my existing games? Yes. 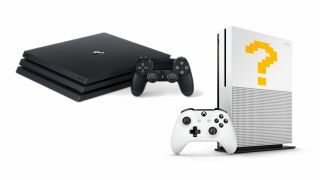 Both Sony and Microsoft have made it clear that their respective new consoles will be improvements on the same generation, rather than a generational leap. Your current games are safe. Sony has even said it has no plans to create games exclusively for PS4 Pro, while Microsoft has left room for Xbox One Scorpio-exclusive titles somewhere down the line. Can PS4 Pro and Xbox One Scorpio use my current accessories? PS4 Pro doesn't use any exclusive new accessories, though it will come with one of those new DualShock 4 controllers with a mini-Light Bar on the front. Your old controllers, headsets, PS4 Camera, and just about anything else you plug in and/or sync up should work. Microsoft is pursuing a similar "everything works" philosophy for Xbox One Scorpio but, again, it's been less specific. Praise be to Andrew House and Phil Spencer (bosses of PlayStation and Xbox respectively), you almost definitely won't need to buy an all-new set of controllers just to do local multiplayer any time soon. Do PS4 Pro and Xbox One Scorpio support VR? Yes they do, but probably not the same kind of VR. PlayStation Pro can run certain PlayStation VR games like Farpoint at an enhanced resolution. Scorpio is also designed to work with VR, with the rumors (and established business relationships) pointing toward Oculus Rift integration. What will PS4 Pro and Xbox One Scorpio cost? Sony has confirmed that PS4 Pro will cost $399/£349. That's as much as a standard PS4 when it first came out. Microsoft has made no indication of what Xbox One Scorpio will cost but $399/£349 is a likely price point here as well. Given its improved hardware, I'd prepare for Scorpio to go as high as $499/£429, Xbox One's original launch price with included Kinect sensor. When are PS4 Pro and Xbox One Scorpio coming out? PS4 Pro will launch internationally on November 10, 2016. Microsoft's current release window for Xbox One Scorpio is holiday 2017. Barring logistics problems, there isn't much chance for PS4 Pro's date to slip at this point, but Scorpio could still go one way or the other.